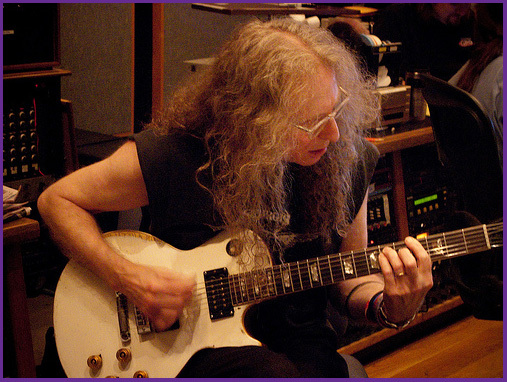 As the 1980’s drew to a close, Waddy Wachtel found himself to be one of the most sought after guitarists on the music scene in Los Angeles, and was called by some “sideman to the stars.” Waddy was part of a group of session musicians that were called "the L.A. session-musician 'mafia' “ by Dave DiMartino, in Singer-Songwriters: Pop Music's Performer-Composers, from A to Zevon, which included Andrew Gold (multi-instrumental musician), Russ Kunkle (drums), Leland Sklar (bass) and Jai Winding (piano). By the end of the 1980’s Waddy had also earned a reputation as a dynamite producer. In 1988 the hit song by the Church “Under the Milky Way” was released and showed Waddy’s incredible production abilities. The Church called upon Waddy to produce many of their albums. In 1988 and 1989 Waddy was also called upon to play on many other artist's albums including Melissa Etheridge, Don Henley, Warren Zevon, Cher, Stevie Nicks and Herb Alpert. 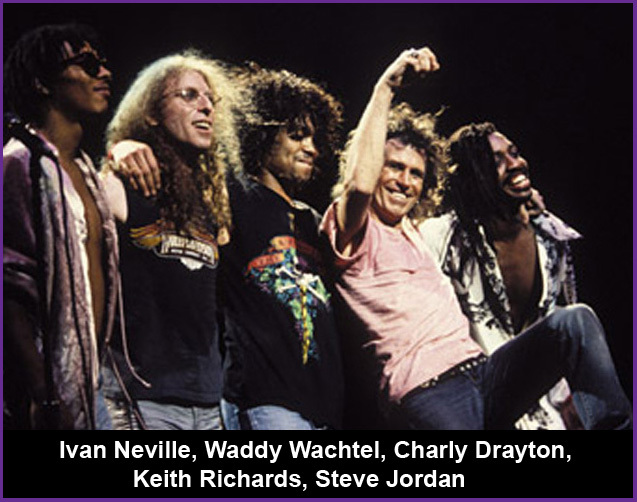 Also in 1988 Waddy Wachtel was summoned by his old friend Keith Richards to assist him with production, song writing and guitar on his first solo album Talk Is Cheap which led to the formation of Keith’s touring group The X-Pensive Winos and their 1988 tour. Waddy was involved with all of Keith’s solo albums and toured with the X-Pensive Winos through 1993. The X-Pensive Winos toured in 1992 and 1993 after the release of Keith's next album "Main Offender". Waddy not only played various instruments on that album, but he contributed to writing a few of the songs, added background vocals and was involved in the production. Both X-Pensive Winos tours were extremely successful, and fans are still pleading for more of that magic. 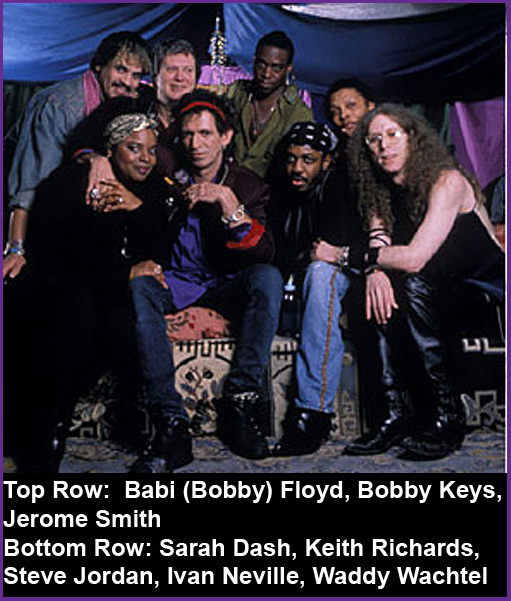 For the first half of the 1990’s, Waddy not only continued touring with Keith Richards but also appeared on albums by Iggy Pop, Bob Dylan, Ringo Starr, Hall and Oates, Rod Stewart and Joe Walsh. Other performers he added guitar licks and production to were Bon Jovi, Diana Ross, Bob Seger & The Silver Bullet Band, Warren Zevon, Marty Balin, Tracy Chapman, Neil Diamond, Spinal Tap, Tom Waits, Jackson Browne, Kris Kristofferson, Randy Newman, The Bee Gees and others. In 1995 he considered it a great honor to be asked to play on an album by an artist he had always admired - Brian Wilson. 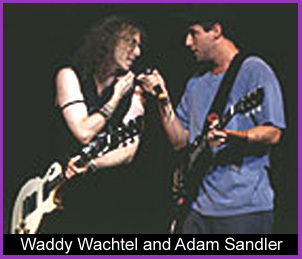 A new and long lasting friendship began in 1996 when Waddy Wachtel hooked up with Adam Sandler to play on his album "What the Hell Happened to Me?" That same year they went on a short tour together with a band including Jon Rosenberg, Mike Thompson, Bob Glaub, Teddy Castelucci and Don Heffington. Waddy and Adam have a unique friendship that developed over the years as Waddy played on all of Adam’s albums and later wrote the music scores for his films. 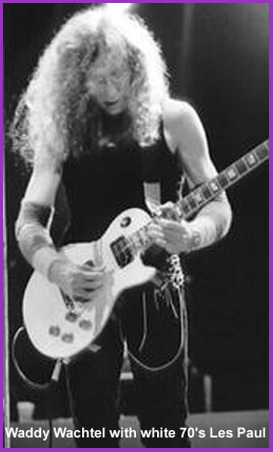 Adam also had a great time singing and playing on stage with the Waddy Wachtel Band at The Joint in Los Angeles in the early 2000’s and returned to sit in again on numerous occasions with the band. 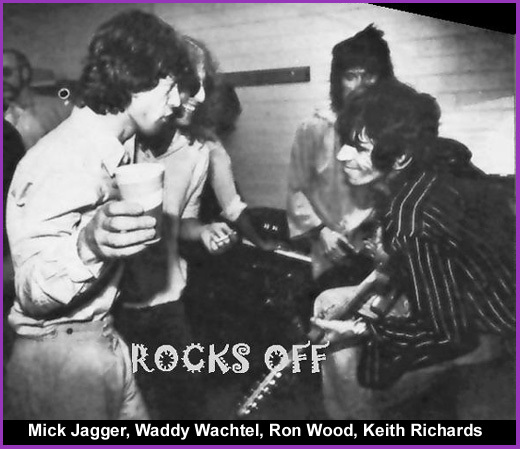 Mick Jagger, Keith Richards and Ron Wood recognized Waddy’s incredible guitar playing abilities and invited him in 1997 to play on their album “Bridges to Babylon.” Waddy is one of very few “outside” guitarists who have ever appeared on a Rolling Stones album. As the decade wound to a close, Waddy Wachtel wasn’t about to slow down. The end of the 90’s found him going into the studio to record with both old friends and new artists. He knew he was given a talent and was prepared to take the opportunities to explore new venues. In 1998 he also performed live at benefit concerts with Jackson Browne, Warren Zevon and other friends, and took a step toward a new adventure...... Writing songs and sound tracks for films. He worked on the music score for Adam Sandler's film "The Waterboy" which also featured a song he and Joe Walsh wrote for it. Everyone was popping corks or bemoaning the Y2K bug as the new century came. Waddy Wachtel was wondering what new adventures were going to come his way. Many new and unexpected gifts arrived. While still busy in the studio recording and exploring the possibilities of all the new computer orchestration available, Waddy Wachtel and his friends Phil Jones and Rick Rosas came up with the idea to play the music they really loved in a small venue in Los Angeles. 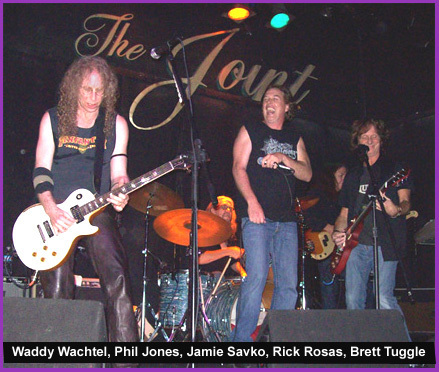 Thus the Monday Nights at the Joint was created in May of 2000, and the Waddy Wachtel Band (with a variety of band members) has continued performing those exciting live shows ever since. 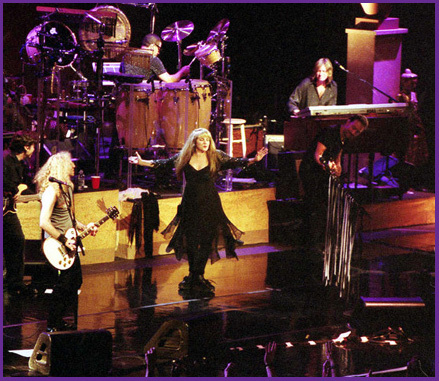 When approached by his old friend Stevie Nicks to assist her on her new album in 2001, Waddy Wachtel was happy to work on the album and go out with her on her subsequent Trouble in Shangri-La tour with fellow bandmates Lenny Castro, Sharon Celani, Sheryl Crow, Al Ortiz, Scott Plunkett, Carlos Rios, Mark Schulman, Mindy Stein and Brett Tuggle. The tour was extremely successful, and Waddy continued to work with Stevie as guitarist and musical director for all her following tours and albums. In 2001 the Adam Sandler movie "Joe Dirt" was released, on which Waddy wrote part of the original music score.